Dec. 4, 2017, 10:30 a.m.
By Christine Schmidt @newsbyschmidt Dec. 4, 2017, 10:30 a.m.
“One of Alabama’s U.S. Senate candidates is a MONSTER,” a recent Facebook video declares. You see, the thing that makes a candidate a “MONSTER” in Alabama is…being a Democrat. “The other guy would have to be some kind of a Class A creep to be worse than a Democrat in Alabama, right?” Ian Hoppe, the video’s host and AMG’s managing producer of news video, deadpans. In the swirl of the Roy Moore saga, in which The Washington Post reported that the Republican senatorial candidate had numerous inappropriate interactions with underage girls, Reckon’s team of a dozen reporters, columnists, and social media specialists have spent the past few months trying to connect with the voters who will actually decide that Senate seat on December 12: Their existing audience of Alabamians, regardless of political affiliation. What happens when you build a brand from the ground up with the aim to put audience at the heart of the journalism? What happens when we give journalists used to going it alone a collaborative space and shared goals? What happens when you make sharing and conversation not just PART of the metric mix, but the MAIN metric? What happens when you turn local, hard-news producers to the work of making journalism for a social audience FIRST? What happens when you try to be the hub, and not the OWNER, of the most important news? The brand largely consists of the Facebook page, with 29,000 followers, and a fledging Twitter account with 2,600 followers, sharing AL.com content and its original videos. 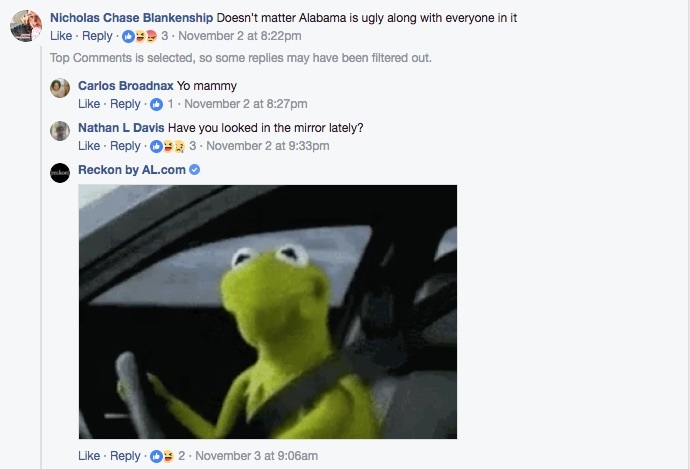 (AL.com’s main Facebook page has over 600,000 followers, but Holmes says they’re trying to move more deliberately and at a slower pace with Reckon as it grows.) The new page uses a lighter tone, is more experimental in posts, and allows its editors to be more active in the comments and bring in reporters to back up their reporting. But it’s not immune to trolls or cyberbullying. [Sue Ann Balch’s] time spent talking online this year with Clinton voters in California hasn’t changed her political views but has strengthened her desire to see change in Washington and the ouster of longtime politicians. Reckon also features content beyond political current events: why Alabama has a short bit of panhandle coastline along the Gulf of Mexico (with 1.2 million views), the defining characteristics of the South (over 500,000 views), and a “Reckonomics” infographic about Alabama’s proportion of foreign-born residents compared to the U.S. as a whole. 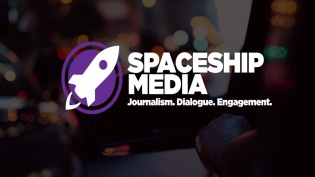 “Can we, as an established news company, create something that feels like a news startup focused around investigative and enterprise news, done for a social audience?” Holmes said. In 2018, Reckon will expand beyond its Facebook existence to in-person events through a partnership with the David Mathews Center for Civic Life. Through the partnership, Reckon staff will participate in forums held by the Alabama-based nonprofit. The team will also continue participating in civic events, such as one focusing on the criminal justice system, with the Southern Poverty Law Center and the libertarian law firm Institute for Justice. 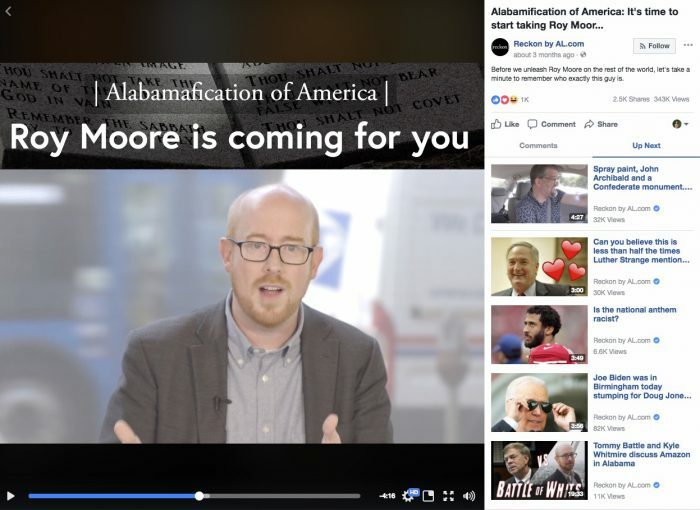 The main image is a screenshot from Reckon’s video Alabamification of America. POSTED Dec. 4, 2017, 10:30 a.m.
Schmidt, Christine. "AL.com’s new Facebook brand, Reckon, aims to build an identity that breaks out of newspaper voice." Nieman Journalism Lab. Nieman Foundation for Journalism at Harvard, 4 Dec. 2017. Web. 23 Apr. 2019. Schmidt, Christine. "AL.com’s new Facebook brand, Reckon, aims to build an identity that breaks out of newspaper voice." Nieman Journalism Lab. Last modified December 4, 2017. Accessed April 23, 2019. https://www.niemanlab.org/2017/12/al-coms-new-facebook-brand-reckon-aims-to-build-an-identity-that-breaks-out-of-newspaper-voice/.